Yishan started working at Hoots, Baker, & Wiley, P.C. full-time September 2017. 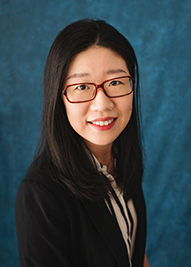 Prior to that, Yishan worked as an office assistant during the 2014 tax season with the firm. Yishan had accounting internships at two firms in Eugene while attending University of Oregon. Prepares tax returns for individual, partnerships, corporations, and trusts. Performs all aspects of payroll, including quarterly and annual reporting. Working closely with clients and perform bookkeeping for some clients. Assist other team members with general accounting duties needed. Holds a B.S. degree in Accounting from University of Oregon.